Dr. Moss graduated from Clemson University with a Bachelor of Science degree in 1970. She then went on to be the first female graduate of the Medical University of South Carolina - College of Dental Medicine three years later (follow link for more info). She then pursued and completed a Medical Anesthesiology Residency at George Washington Hospital in Washington, DC. 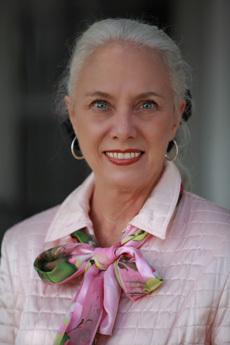 She was hired onto the MUSC College of Dental Medicine faculty before joining with her husband, Dr. Larry Owen, in private practice in 1980. The profession of dentistry has been a rewarding career for Dr. Moss. She's met and helped many wonderful people, learned interesting things, and hopefully taught her patients well about what she knows best -- oral health. As a dentist, each day presents exciting challenges that need solutions! The dental field has evolved rapidly over her career, but one aspect that has remained constant is the obligation she feels to provide her patients with the highest quality of dental care possible. In addition, she's logged over 1000 hours of continuing education over the span of her career in areas such as orthodontics, implants, periodontics, endodontics, cosmetic bonding and veneers, fixed prosthodontics, CPR, and first aid. When she's not working, Dr. Moss enjoys keeping active in her community; she is a volunteer dental provider in the Kershaw County Community Medical Clinic in Camden, an active supporter of the United Way of Kershaw County and the KershawHealth Foundation, and a member of the Camden Garden Club. Her favorite pastime, though, is world traveling. Both she and her son, Dr. Will Owen, are international dentists after having practiced on both continents in the Western Hemisphere, where they provided free dental care for residents of Conocotto, Ecuador in the spring of 2009. Dr. Owen completed undergraduate studies at Clemson University and the University of South Carolina then he went on to receive his Doctor of Dental Medicine from the Medical University of South Carolina. 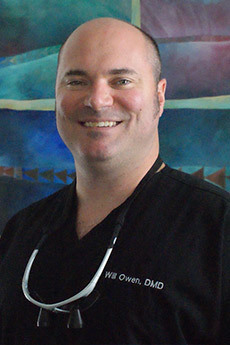 Dr. Owen is committed to keeping abreast of the latest dental techniques and technology through continuing education. In 2012, he completed a two year comprehensive orthodontics course an is proud to offer this service to his patients. In addition, he has completed over 300 post-graduate hours continuing his education in courses focusing on orthodontics, occlusion and TMJ, implant restorative dentistry, oral surgery, cosmetic bonding and veneers, crown and bridge, endodontics and periodontics, all while maintaining certification in CPR and first aid. Having grown up in Camden, SC, Dr. Owen realizes the importance of helping the citizens of this community maintain their oral health. Realizing that those who usually live the longest usually do so with most of their natural teeth, he believes very strongly in patient education and the prevention of dental decay and periodontal disease. His treatment goals are very simple; to impart value by using the most conservative methods available, providing the best long-term prognosis, while keeping patinet costs to a minimum. Dr. Owen will not recommend any treatment that he would not recommend to a family member in a similar situation. Furthermore, he will not be satisfied with anything he puts in your mouth that he would not have in his own mouth. He's not going to tell his patients what procedures have to be completed. He's going to give them options, with advantages and disadvantages, and let them decide according to their own healthcare goals. This level of trust requires a two-way relationship between a dentist and his patients to which Dr. Owen is firmly committed. Dr. Owen is also highly involved in the community as a member of Rotary International. He volunteers with Give Kids a Smile, East Cooper Community Outreach Clinic, and Community Medical Clinic. He's also been involved with dental missions to Quito, Equador, and he's an Eagle Scout and member of the Order of the Arrow through the Boy Scouts of America.